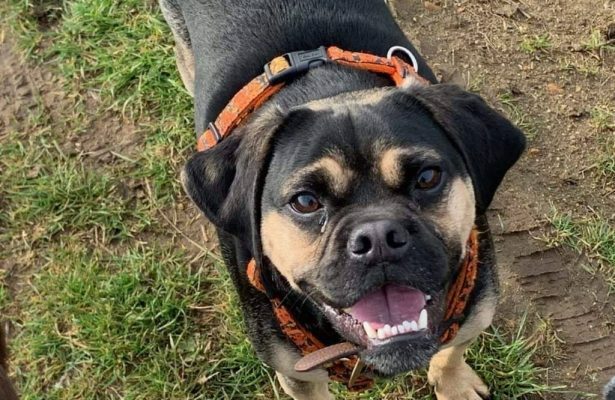 Is a lovely neutered pug cross medium sized boy of around 2 years . He loves to snuggle into a ball and enjoys a good snooze after his walk . He’s a clever boy with good recall who enjoys training and learns quickly. He would benefit from further training as he can get a little excited and jump up so a home with older children would be best. 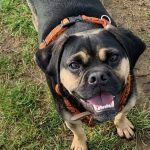 Hubble loves company so would suit a home with another dog and not being left for long periods as he does have a little separation anxiety , however his foster mum noticed that with a regular walking routine he is quick to settle down. Hubble can bark at things he’s unsure of but will do anything for a treat!